Roscoe Conkling was among the most recognized of New York's citizens in 1888. 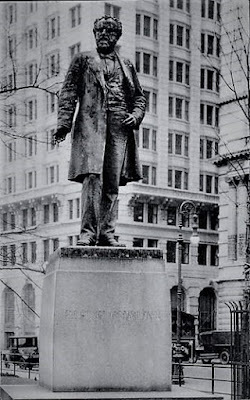 Born in Albany on October 30, 1829, he grew up among lawyers and politicians. His father, Alfred Conkling, was both a federal judge and a U. S. Representative; and his mother, the former Eliza Cockburn, was cousin of Lord Chief-Justice Sir Alexander Cockburn. Noteworthy political figures who passed through the Conkling parlors included Martin Van Buren and John Quincy Adams. Roscoe was, however, a rambunctious child and a frustration to his father, who called him a "utterly untutored" at the age of 13. He was send off to boarding school at Mount Washington Collegiate Institute to receive disciplined instruction. It worked. At the age of 17 Conkling chose to study law within a Utica firm rather than continue to college. His outstanding oratory skills and his strong views on human rights made him a recognized speaker. At only 18 years old he spoke passionately and eloquently about the starving victims of Ireland's Great Famine. Conkling married Julia Catherine Seymour, and was admitted to the bar in 1850. He went on to be a district attorney, and a member of both the United States Senate and the House of Representatives. 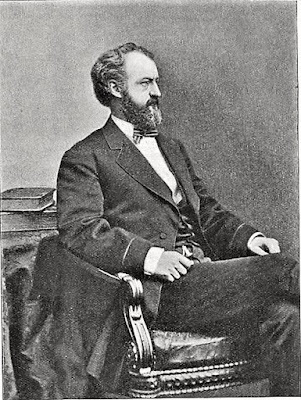 Despite his political successes and failures, Conkling became widely known for his philandering. The New York Times gleefully reported on his extramarital affairs, most notably with Kate Chase Sprague. Kate was the wife of Senator William Sprague IV and the daughter of Chief Justice Salmon P. Chase. The Times printed the scandalous story of Senator Sprague discovering the couple in his Rhode Island summer residence, then chasing Conkling with a shotgun. Many newspapers of the 19th century were unabashedly politically biased, often conjuring up scandals to defame political figures. Conkling's supporters wrote letters to the editor of The New York Times denouncing the articles as false and calling the Times’ journalism disreputable and irresponsible. Nevertheless, readers clung to every word of the unsubstantiated improprieties. Conkling was at his Wall Street office on March 12, 1888 when the Great Blizzard of 1888 struck. The storm, also referred to as The White Hurricane, was one of the most severe in recorded history. Forty inches of snow was dumped on Manhattan and sustained winds of 45 mph created snowdrifts up to 50 feet in height. While most citizens remained sheltered in their homes, Roscoe Conkling had lingered too long in his office. By the time he left the streets were deserted. All the hansoms and horses had been sheltered in their stable. Conkling set off on foot to The New York Club on 25th Street. He lost his way in the blinding storm, made worse because the wind blew out all of the gas street lamps. So severe were the white-out conditions and pitch darkness that he could not find his way out of Union Square. He wandering there for nearly half an hour. When he finally reached the door of the club two hours after leaving his office, he collapsed, suffering from exposure. My dear sir, Bless your kind soul. You know one can’t step foot in the snow without stepping into the newspapers. I had an ugly tramp in the dark – the lights out, from Wall Street up, over drifts so high that my head bumped against the signs, and dug-outs opposite the store doors suddenly letting a wayfarer down a foot or two over snarled telegraph wires and slippery places, with a blizzard in front not easy to stand against, and so cold as to close the eyes with ice, and drifts were not packed enough to bear up, in which one sank to the waist. Bumps and falls, and strains and tugs made it quite an interesting excursion, but not one worth anyone’s while to talk about. Conkling seemed to be recovering. He worked on legal papers and other business from his bed. But his condition worsened and he began talking incoherently. On April 18, 1888 he succumbed. Two years later a group of esteemed citizens, including former Vice President Levi P. Morton, Clarence A. Seward and Cornelius N. Bliss, raised funds to erect a statue to Conkling. They commissioned sculptor John Quincy Adams Ward, later referred to as “The dean of American sculptors,” to design a bronze statue. Julia Conkling requested that he depict her husband speaking before the Senate. In fact, she visited Ward's studio regularly over the next three years "and the sculptor made use of her intimate knowledge of the subject and her keen judgment in matters of form," according to Every Where magazine later. There was one more hurdle to overcome. The proposed base was deemed too large by Calvert Vaux and the Advisory Art Committee. They accepted the statue's design "with the proviso that its lower member be reduced in size from 10 feet 3 inches to 9 feet square." John Quincy Adams Ward was resolute that his original dimensions be preserved. He appeared before the Park Board on October 25, 1893 to forcefully voice his opposition. This time the board relented. In December 1893 the statue was unveiled with no formal ceremony, as requested by the family. Conkling's figure, cast at the Henry Bonnard foundry in Manhattan, stood eight feet high and weighed 1,200 pounds. 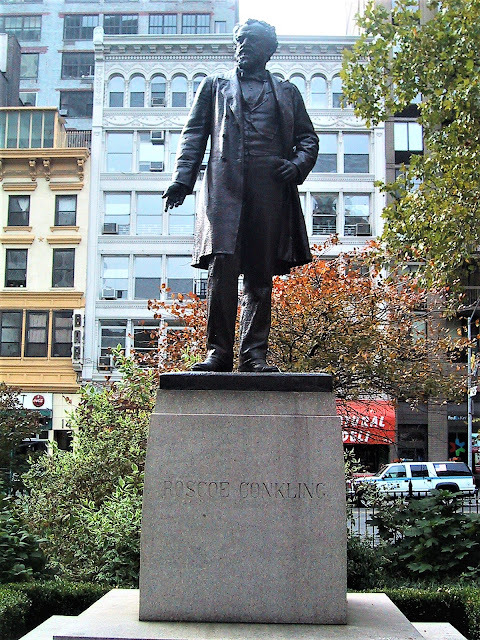 The eight-foot high granite pedestal was simply inscribed "Roscoe Conkling." Robert G. Ingersoll addressed those present and took a swipe at Conkling's earlier political enemies. "When the hounds that barked at his heels shall all have been forgotten, [his] record will remain and take on divine tints...that will give his statue colossal proportions in his niche in the ages." Although generally lauded as a "heroic bronze" and a dignified representation of the politician; there were, of course, criticisms. On December 24, 1893 The New York Times hinted at flaws. The writer lamented that Ward had not had the chance to exhibit a full-size plaster model. "Had an exhibition been opened last Spring...the sculptor could have shown that statue and had a chance to see it away from his studio under different lighting There can be no question that it would have been altered." Every Where magazine was more specific in its criticisms, which focused mainly on the tailoring of the clothing. "His Prince Albert coat falls in smooth and graceful folds to the knees, and the neck is neatly and becomingly dressed. The trousers, however, are about two inches too long, and the inevitable dent in the left knee shows up clearly...The vest, too, appears to have been worn for some time without pressing, and is drawn up in a rather unbecoming fashion." An early postcard clearly shows the offensive tailoring. The critic said that, of course, a statuary likeness of a person should be faithful to the original, "but there is no excuse for carrying the matter of realism to the point where it is ludicrous and ridiculous...one cannot help wondering why the sculptor thought it necessary to array his subject in a smooth, well-fitting frock, with a crumpled waistcoat displayed beneath." In 1942, during World War II, Franklin D. Roosevelt initiated a program to scrap bronze statues and recycle their metal into weapons of war. He told reporters on August 7 that many bronze memorials "would serve a more useful purpose if junked." It may have been that threat that prompted the Conkling statue to be painted brown, disguising its greenish bronze patina. 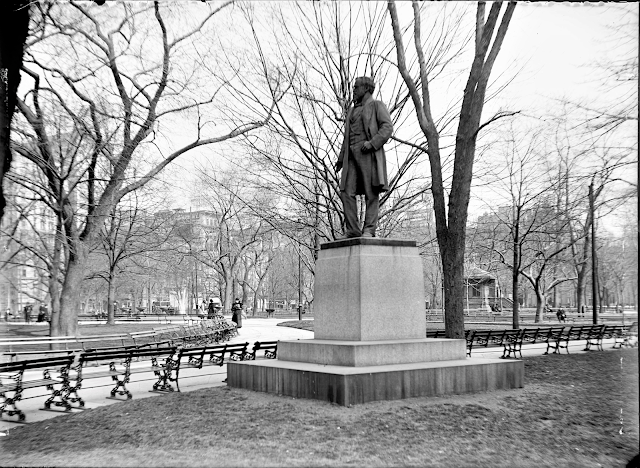 The Conkling statue was moved 20 feet in the summer of 2000, and a year later it received a full restoration as part of the Citywide Monuments Conservation Program. At a cost of $12,000 it was chemically re-patinated to its historically correct color and tone, and cleaned of dirt and corrosion. And despite Robert G. Ingersoll's prediction that the statue would ensure Conkling's memory "in his niche in the ages," most park goers pass it without a glance; and have no idea, nor care to know, who Roscoe Conkling was. I saw the Conkling sculpture when I was wandering around and was glad to see it. He was quite a character. He is in good company in MSP - Seward, Arthur, Farragut. Arthur is kind of forgotten, or overlooked, too. Saw your post on his home. What a shame!